We do not recommend canning summer squash or zucchini. 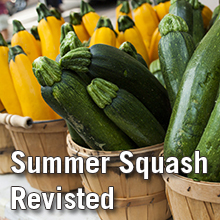 We recommend preserving summer squash or zucchini by pickling or freezing. Summer squash is good for you. It is low in calories and many varieties provide vitamin C, potassium and, if the skin is eaten, beta carotene. Preserve summer squash by freezing, pickle them for canning or dry them. Freezing Summer Squash: Choose young squash with tender skins. Wash and cut in ½-inch slices. Blanch in boiling water for 3 minutes; cool in ice water for at least 3 minutes. Drain and package into freezer bags or freezer containers, leaving ½-inch headspace. For frying: Follow the above instructions, but before packaging, dredge in flour or cornmeal, spread in single layer on cookie sheet and freeze just until firm. Package quickly into freezer bags or containers, leaving ½-inch headspace. Grated zucchini (for baking): Choose young tender zucchini. Wash and grate. Steam blanch in small quantities 1 to 2 minutes until translucent. Pack in measured amounts into containers, leaving ½-inch headspace. Cool by placing the containers in ice water. Seal and freeze. If watery when thawed, discard the liquid before using the zucchini. (Yield: 2 pint jars) This sweet squash pickle recipe is from So Easy to Preserve, p. 145. Wash squash and cut in thin slices. Peel and slice onions thinly. Place onions and squash/zucchini in a large bowl and sprinkle with salt. Cover with cold water and stir to blend in salt. Let stand 2 hours. Drain thoroughly. Bring remaining ingredients to a boil. Pour over squash and onions. Let stand 2 hours. Bring all ingredients to a boil and heat 5 minutes. Pack vegetables into hot jars. Leave ½ inch headspace. Fill jars to ½ inch from top with boiling liquid. Remove air bubbles. Wipe jar rims. Adjust lids. Process 15 minutes in boiling water bath canner. Note: See So Easy to Preserve (p. 145) for recipe for squash dill pickles. E.L. Andress and J.A. Harrison. 2006. So Easy To Preserve. Georgia Cooperative Extension/The University of Georgia. “Pickled products” Pp. 117-186.